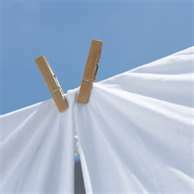 I love the smell of sheets that have dried on the clothesline in the summer sun. Tonight I took my clean bedding outside to hang awhile. It’s been so hot that I figured it wouldn’t take long for those sheets to dry and get all fresh-smelling. Ten minutes after I made the trip to my backyard clothesline, I couldn’t believe my ears. What a sweet sound. It was raining. It hasn’t rained in six weeks. It rained on my sheets. If I had known, I would have hung out my sheets a long time ago. Come hang those magic sheets on my clothesline! We haven’t had rain for 8 weeks! So, so, so dry here. But it’s interesting — even amidst this drought that is severely affecting the local farmers, there is abundance — the wheat crop was exceptional (for those who had a wheat crop). And…Mark and I found a pick-your-own blueberry farm where they are having their best crop ever. We picked nearly 30# of beautiful blueberries! Talk about magical sheets — just the very thought of putting your sheets on my clothesline coaxed the rain out of the sky this evening! We got more than an inch!